Universal Pictures is betting big on their June 9 release The Mummy to kickstart an interconnected series of films revolving around their stable of classic monsters. As has been rumored in the past, an article in The Hollywood Reporter has reaffirmed rumors that the studio is still going after superstars Dwayne Johnson to play The Wolfman and Angelina Jolie to portray the Bride of Frankenstein within their Dark Universe. While neither actor is signed, they have both been pursued for quite some time, with Universal supposedly greenlighting Jolie’s 2015 arthouse underperformer By the Sea to curry favor for her to play the titular Bride. Johnson was part of the previous Mummy franchise at Universal, launching his acting career with 2001’s The Mummy Returns and 2002’s The Scorpion King. Lon Chaney Jr. originated the role of Larry Talbot/The Wolfman in 1941 and reprised the part in four sequels, with Benicio del Toro recently taking on the Talbot role in the 2010 version of The Wolfman. 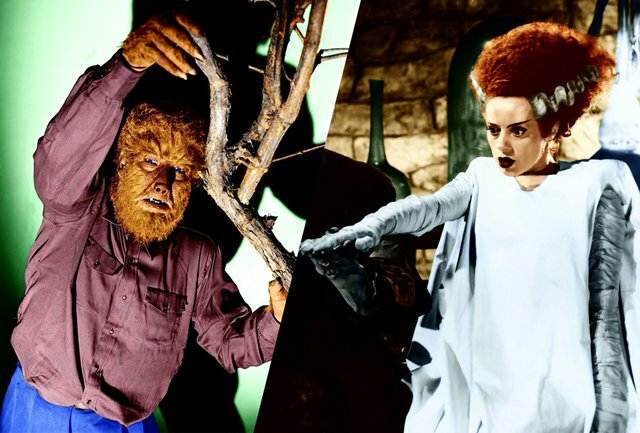 Elsa Lanchester played the dual role of author Mary Shelley and the Monster’s mate in the 1935 classic Bride of Frankenstein, with Jennifer Beals (Flashdance) playing a new iteration of the role opposite Sting in the 1985 dud The Bride. It has also been confirmed that the budgets of the Dark Universe films may not all be in the same tentpole-sized $125 million domain as The Mummy, with Blumhouse head honcho Jason Blum (Paranormal Activity, The Purge, Get Out) in line to produce several smaller-budgeted entries. Whether those will also feature A-list acting talent or be more spin-offs/sidequels remains to be seen. Another interesting tidbit is the fact that Warner Bros. is reportedly mulling a lawsuit over the title “Dark Universe,” which it had previously announced as an alternate title for its in-active-development Justice League Dark. Dark Universe was begun by core creatives Alex Kurtzman (screenwriter of Transformers and Star Trek), who also serves as director and producer of The Mummy, the inaugural film in the new classic monster series, and producer Chris Morgan (screenwriter of Wanted, The Fate of the Furious). Also joining the enterprise are Oscar winner Christopher McQuarrie (Mission: Impossible series, The Usual Suspects) and David Koepp (War of the Worlds, Jurassic Park). In addition, the studio has confirmed that Oscar winner Bill Condon will follow his worldwide smash Beauty and the Beast, one of this year’s biggest hits—which crossed $1 billion at the global box office and became the most successful musical of all time—by directing Bride of Frankenstein, from a screenplay by Koepp. The next film from Dark Universe, Bride of Frankenstein will be released on Thursday, February 14, 2019. The studio has also confirmed that previously-announced stars Johnny Depp and Javier Bardem, who appear together in this summer’s Pirates of the Caribbean: Dead Men Tell No Tales, will star as The Invisible Man and Frankenstein’s monster, respectively, in the shared universe. They are joined by Tom Cruise as soldier of fortune Nick Morton and Oscar winner Russell Crowe as Dr. Henry Jekyll, who lead the all-star cast of The Mummy, along with Sofia Boutella, the actress who embodies the title role in that film. As its organizing principle, Dark Universe films are connected by a mysterious multi-national organization known as Prodigium. Led by the enigmatic and brilliant Dr. Henry Jekyll, Prodigium’s mission is to track, study and—when necessary—destroy evil embodied in the form of monsters in our world. Working outside the aegis of any government, and with practices concealed by millennia of secrecy, Prodigium protects the public from knowledge of the evil that exists just beyond the thin membrane of civilized society…and will go to any length to contain it. Universal has also launched a viral site for the organization which you can explore by clicking here.